1.1. Virabhadra the auspicious hero raging like flaming fire is Shiva‘s ferocious instrument for destruction of ignorance, ritualism and dogma. Virabhadra, the Great Warrior,is the sublimation of Shiva’s impatience and anger; the embodiment of his resolute might; and is therefore regarded an aspect of Shiva in blazing mood burning down delusion and falsehood (samhara –murti). 1.2. It is said; Shiva represents pure-consciousness (jnana shakthi); Devi is the creative energy, the thought within his consciousness, the will to intend an act (itccha shakthi); and Virabhadra is the power of action (kriya-shakthi) the determined might to transform that will into an act. Virabhadra, the action-hero, personifies implicit faith, absolute devotion and reverence as also the ruthless efficiency in carrying out the command of his creator. 1.3. Virabhadra also symbolizes the sharp incisive power of discrimination, potent in each of us, to sever attachments to conceited values, misplaced faith and the routines that we all run through thoughtlessly. He points out to our adulation of that which should not be esteemed; and to our neglect of that which ought to be valued. Virabhadra’s message is to open our heart, to embrace everything that life has given us, without fear or prejudice. Virabhadra destroys in order to save. 2.1. The origin and the relevance of Virabhadra have to be appreciated in the context of the running feud between Daksha and Shiva spread over many eons, manvantara. The two mighty personages represent two different realities, two divergent faiths, two separate streams of understanding and two opposed world orders. 2.2. Daksha meaning ‘able, competent, skilled ‘in performing rituals, is rooted in the propriety and the relevance of elaborate rituals; and in their techniques as prescribed in the scriptures. He is also a great believer in the organized hierarchy of gods and the proper order of apportioning the oblation among various levels of gods. He is one of the Prajapatis and is sometimes regarded as their chief. He is charged with the responsibility of ensuring perpetuation of life on earth, as also the richness and dignity in life. He is a very prominent person of the established order; and, in fact, is at its very core. Daksha holding the office of Prajapathi was a lawgiver who formulated rules for conduct of behaviour in the society and norms for the orderly working of the society along the well respected traditional lines. The world order as envisaged by Daksha defined the precise role and conduct not merely of humans but of gods as well. He expected from all, reverence to his self and obedience to his law. He would not tolerate subversive bunch of renegades who had scant regard for the social dignity and decorum. Daksha therefore represents the matter-of-fact logical mode of thinking, the way in which most of us would like to lead our lives. 2.3. Shiva, in contrast, was beyond the pale of normal society; and stood for everything that Daksha dreaded. Shiva was a Vratya, and the most distinguished among them, Ekavratya, an unorthodox hermit, who lived by his own rules, not always acceptable to traditional society. He refused to conform to the ways of the world. 3.1. Vratyas were a community of dissenters, social rebels and ascetics living under a set of strange religious vows (Vrata). They totally rejected the Vedic rites and rituals. Vratyas followed their own cult-rules and practices; and did not care either for the rituals or for initiations (adhikshitah); and not at all for celibacy (Na hi brahmacharyam charanthi).They did not engage themselves in agriculture (Na krshim) or in trade (Na vanijyam).They behaved as if they were possessed (gandharva grithaha) or drunk or just mad. They roamed about the countryside and lived among the warriors, herdsmen and farmers. They were worshippers of Rudra, Isana or Mahadeva; and yet were regarded irreligious. In the words of Shri DSamapth, they were the ‘freethinkers who gave a very time and space based approach to the issues; and, were the initial social scientists with rationality as the anchor’. 3.2. 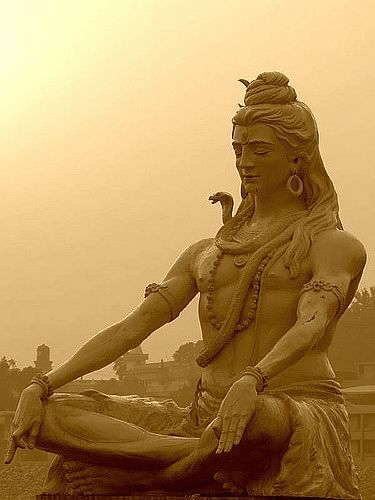 Shiva, Rudra the wild one, like a true Vratya, wandered among cremation grounds with a rowdy bunch of renegades consuming intoxicants forbidden in polite society and slept amidst the warmth of burning funeral pyres. He sang and danced whenever and wherever he wanted to with little heed to decorum and protocol. Shiva refused to indulge in any social rule having pretentions of respect. He had no home, no possessions, no family, no vocation; he was a drifter, ritually impure, unsuitable for married life. 4.1. Uma was the daughter of Himavat (Uma Haimavathi) by Menaka or Mena [In this version she is not related to Daksha]; she was desperately in love with Shiva but had a hard time persuading him to marry her. Shiva narrated all his disqualifications that failed to make him a dependable householder. Despite that, Uma followed Shiva wherever he went, over hills, across desolate plains and dense forests and through cremation grounds. Shiva at first ignored Uma. He barely acknowledged her. Uma finally told her reluctant lover, “It is for the good of both of us.You are incomplete without me and I am incomplete without you. I do not ask for anything, but you. I accept you for what you are, not deterred by what you do not have…I would like to observe with you”. Shiva could no longer be without his loving consort. 5.1. Daksha Prajapathi’s intense dislike of Shiva was because the latter was a vagrant, a tramp who had neither commitments nor sense of values in life. 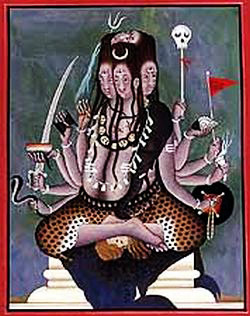 Daksha called Shiva – a Kapalin having neither father nor mother, impure , incorrigible and proud abolisher of rites and demolisher of barriers who roams about in dreadful cemeteries, attended by hosts of ghosts and sprites, like a madman, naked, with disheveled hair, wearing a garland of skulls and ornaments of bones of the dead, pretending to be Siva (auspicious), but in reality is a- Siva (inauspicious), insane, leader of the insane Bhutas (spirits), the wicked hearted whose nature is essentially darkness.’Let this Bhava (Siva), lowest of the gods, never, at the worship of the gods, receive any portion along with the gods Indra, Upendra (Vishnu), and others’. 5.2. Uma’s perception of Shiva is of a different kind. It is non-judgmental absolute faith and intense love. There are no words to describe it otherwise. It obviously is unwise. But, that foolish wisdom is a precious gift of grace received in humility of mind and simplicity of heart; an un-bounded loving energy that transforms the world more effectively than the rhetoric. But, that rarely happens. 6.1. The Daksha – Shiva conflict is more along the traditional lines, It is between establishment and anti-establishment. It occurs in every generation and all the time. It is the conflict between normal learning and intuitional understanding; between the conventional point of view and the transcendental experience; and between the man of the world and the one who has cast off all concerns and obligations. 6.2. The Indian traditions, for some reason, have always regarded content-less intuitional understanding and recognition of ‘what Is’ as being far superior to belief systems or a schools of thought. Our ancients always asserted that the immediate experience ( sakshat aparoksha) which liberates is truly superior to the intellectual knowledge of scriptures, rites and rituals. They explained it as the sort of experience that leads to the true understanding of the problems of being and becoming; that which aids to cross over all sorrows (shokasya param trayathi); and to realize one’s true identity. It is beyond the understanding of the intellect; it is experience (we shall return to this theme a little later). 6.4. The emergence of Virabhadra as Shiva’s instrument for destruction of Daksha’s small ’ego’ and for awakening of true understanding in him occurs when Daksha was born as the son of Prachetas and Marisha; and was designated as Prajapathi in age of Vaivasvata Manu. 7.1. The performance of the magnificent and most elaborate Brahaspathi – savana – yajna by Daksha Prajapathi must have been a highly significant event in the very ancient past. 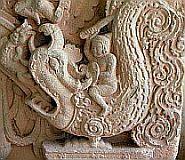 The Daksha story became a ground for fertile epic imagination. Countless versions of the event were described elaborately in various Puranas, epics and folk legends; each version, of course, bending the event to champion its own pet theme. By all accounts, ‘Daksha’s sacrifice’ shook the old world and brought in a new world order. Shorn of prejudices and rhetoric, the legend indicates that Rudra-Shiva an unorthodox god stormed his way into the world of established order, secured there a prominent undisputed status among all gods and claimed a fair share of esteem and oblations that were due to him. It also amply demonstrates the futility and irrelevance of mere scriptural learning, rituals and sacrifices; and upholds the way of right-understanding as the means to liberation from all sorrows. 7.2. But the germ of the story seems to be in the Taittiriya Samhita(2.6.8) , where the gods, excluded Rudra from a sacrifice; and he pierced the sacrifice with an arrow; thereafter a ‘well offered yajna (svista)’ was submitted to Rudra. Gopatha Brahmana too carries a similar story where Prajapathi deprived Rudra of his share in the Yajna; then Rudra pierced the Yajna (prasitra) and gained his share. In these brief references, there is no mention of Daksha by name; and Rudra gains his share of the Yajna by force. There, of course, is no Virabhadra. 7.3. There is another reference to Shiva and Daksha in Ramayana. 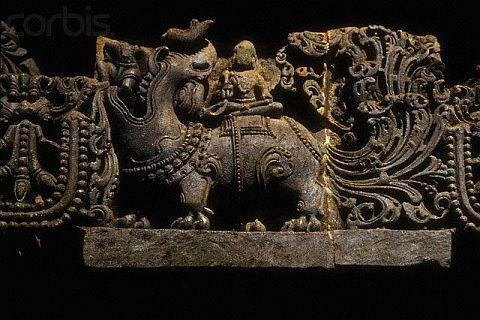 The King Janaka describes the great bow Shiva Dhanus as the one wielded by Shiva when he threatened to destroy Daksha’s Yajna because Devas had not offered Shiva a portion of the oblations. In this version of the legend also there is no mention of Rudra commissioning Virabhadra, or anyone else, to destroy the sacrifice or put the gods to flight. He is simply said to wound the gods with his bow. 8.1. All these references indicate that Shiva ( it is not clear if he was the same as the Rudra of the Rig Veda) who perhaps was at the periphery was determined to break into the world of Vedic rituals , to be recognized as one of the major gods and to secure a fair portion of the Yajna because of the esteem associated with it. 8.2. 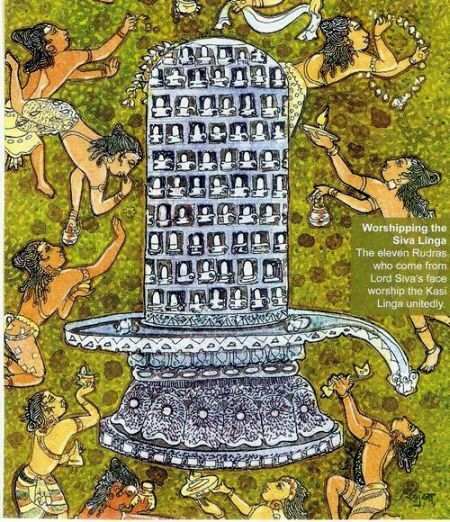 The later epic –poets strung together these references; and spun amazingly elaborate and divergent tales around Shiva – Daksha Prajapathi conflict. The various Puranas were structured, basically, in two levels. 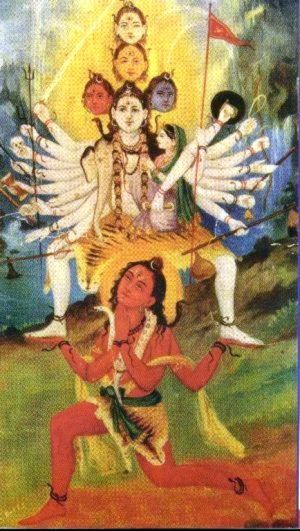 One, Daksha and Shiva were projected as two opposite poles in the society; Daksha representing the establishment and Shiva the anti – establishment and everything that Daksha hated. Uma the Devi was the gracious link of love that connected the two opposing worlds. 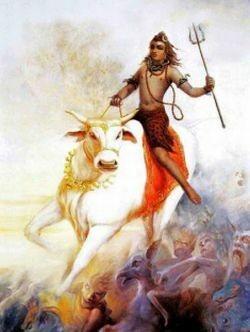 The other was the determination of the Devas to continue to keep Shiva out of the Vedic fold and to refuse him recognition within its orthodox framework by denying him a share of the Yajna; and Shiva’s repeated, determined and forceful efforts to secure the esteem which he thought was due to him. He does eventually succeed not merely in gaining acceptance but also in becoming the premier god in the Vedic pantheon revered with fair share of the Yajna oblations. Along with that, the Pashupathas stood to gain some recognition within the Vedic fold, though it was conceded very reluctantly. 8.3. In addition, two other minor themes run through the narrations: One is the element of Shiva –Vishnu rivalry; and the other is the efforts of the Shaktha cult to use the events at Daksha-yajna in order to relate the origins of its Shakthi peethas and to base its legends. 8.4. There is however a dichotomy in these narrations; and it is not adequately explained. The followers of Shiva, mainly the Pashupathas, did not seem to have faith or respect for the Vedic rituals and their efficacy. Yet, they fight very hard, even by violence, to secure their leader a fair share in the Yajna and to see him established in the hierarchy of the Devas. And, eventually they agreed to become a part of the very Yajna which they set out to destroy. 8.5. 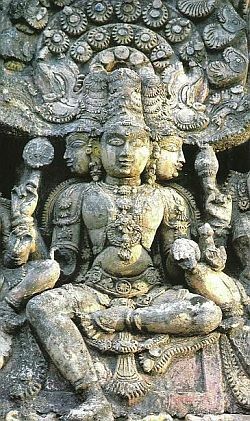 In any case, several Puranas together have woven a very complicated ( at times confusing ) maze of stories involving assumed traditional proprieties, their alleged breach, disputed claims, divided loyalties and prejudices for and against Shiva or Vishnu; and, an undecided stand on the efficacy of Vedic rituals. 9.1. Of the several versions of the Daksha Yajna, the narrations in Vayu Purana, perhaps the oldest of the extant puranas and in Mahabharata are restrained and comparatively brief. They describe, in substance, the waste of food and drinks stored for the Yajna and the burning of the Yajna. Here, Devi is presented, without a preamble, as Parvathi or Uma daughter of Himavat (Uma Haimavathi) by Menaka or Mena . In this version she is not related to Daksha; she does not also visit the Yajna; and she does not die (out of grief at the insult directed at her husband).There are no references in these versions to the previous conflicts or the enmity that existed between Daksha and Shiva. Here, Shiva’s anger is directed not so much against Daksha as against the unfair arrangement devised by the Devas to deprive him of a share of the Yajna. He wills Yajna to be disrupted; but he does not command Virabhadra to kill Daksha. Shiva left to himself, perhaps, would have accepted the position as it were but for Devi who felt slighted and did not want to see her husband belittled by other gods. 9.2. Here, Uma is terribly unhappy that her husband is not invited to a great Yajna where all other gods participate joyously. And she anxiously enquirers why he does not proceed to the Yajna; what holds him back? Mahadeva replied ‘This is the contrivance that in all sacrifices no portion should be assigned to me’. 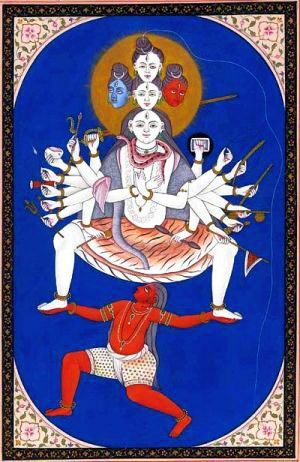 Devi is filled with ‘deep sorrow and trembling’ and is hardly able to restrain as her husband ‘of unsurpassed splendor, glory and power’ is excluded from share of oblations. Then, after prodding from Parvathi, Shiva says “O queen of the gods, behold whom I shall create for the purpose of claiming my share of the oblation in the yajna”. 10.1. He then creates Virabhadra from his mouth . In these versions; there is no beheading of either the Yajna who assumed the form of a deer or of Daksha. There is also no mention of beating up and mutilating various gods and sages assembled at the Yajna. 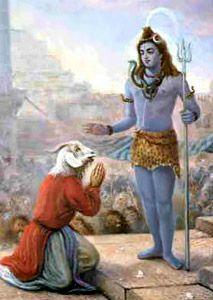 Daksha at the end realizes his folly and submits to Shiva who pardons and grants him salvation. Yajna is concluded successfully. All ends well. Lets us briefly go over the narrations as provided in Vayu Purana and Mahabharata- Book 12: Santi Parva: Mokshadharma Parva. [ The following is extracted from Prof.Wilson’s translation of Vayu-Purana ] We can later have a brief look at the variations of the legend as depicted in other Puranas. 10.2. “ Having spoken thus to his beloved the mighty Mahadeva created out of his mouth a most magnificent and frightening being glowing like the fire of fate (kaala-agni); a divine being with thousand heads , thousand eyes , thousand feet , thousand arms , wielding a thousand clubs, thousand shafts ; holding the shankha , chakra, mace, bearing a blazing bow and battle axe; fierce and terrible shining with dreadful splendour; decorated with crescent moon; clothed in tiger skin; dripping with blood; having a capacious stomach and a vast mouth armed with sharp protruding formidable tusks; his tongue was lightening; his hands brandished thunderbolt; flames streamed from his hair; a necklace of pearls wound around his neck; a garland of flames descended from his breast; radiant with lustre he glowed brilliantly like the final-fire of destruction that consumes all existence. Four tremendous tusks projected from his wide mouth extending from ear to ear; he was of vast bulk, vast strength a mighty war god and destroyer of universe and like a vast fig-tree in spread, shining like a hundred moons at once; fierce as the fire of love; sharp white teeth and mighty fierceness , vigour, activity and courage; glowing like a thousand fiery suns at the end of the world; like a thousand undimmed moons; in bulk like Himadri , Kailasa and Meru or Mandara with all its gleaming herbs ; bright as the sun at the end of ages; of irresistible power; beautiful aspects; irascible with lowered eyes and a countenance of burning sun; clothed in the hide of elephant and lion and girdle of snakes; wearing a turban on the head, moon in his brows. 10.3. Sometimes savage; sometimes benign; having a chaplet of flowers on his head; anointed with various fragrant perfumes adorned with variety of ornaments and many designs of jewels; wearing a heavy garland of karnikara flowers and rolling his eyes in rage. Sometimes he danced wildly , sometimes he sang out aloud, sometimes he wept out uncontrollably; sometimes he spoke gently sweetly , meditated intensely; he was endowed with faculties of wisdom, dispassion , power, penance, truth, endurance , fortitude and self-knowledge. 10.4. Virabhadra of Rudra-manohara –rupa, of terrifying and the same time heart-warming form, born of Shiva’s potent mouth (Va.p.30.122) was thus like Purusha of Rig Veda of immense strength and splendour, a great being with a huge body the size of any mountain, ablaze and adorned with crescent moon. 10.5. His monstrous exterior disguised his true nature of vibrancy – full of wisdom, detachment, sovereignty, asceticism, truth, patientince, fortitude, lordship and self knowledge (Va.p.30.125-136).He greatly resembled Shiva whose emanation he was. 11.2. Then the powerful Virabhadra having heard of the pleasure of his Lord bowed down his head to the feet of his Master and jumping out like a lion loosed from shackles he rushed to despoil the Yajna of Daksha. 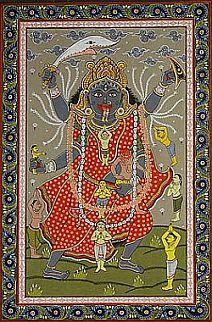 The wrath of Devi took the form of the fearful Rudrakali. 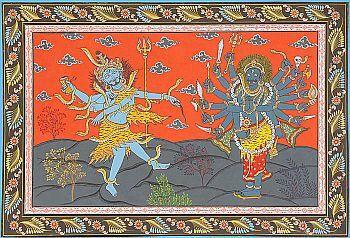 She accompanied Virabhadra with all her train to witness the destruction. 2.1. Virabhadra then created from the pores of his skin powerful demigods the Ganas the attenders on Rudra, of equal valour and strength, who poured out in hundreds and thousands. Then, a loud and confused clamour filled the air and heavens with dread. The mountains tottered , the earth shook, the winds roared wildly, the depths of the oceans were disturbed; the fires lost their radiance and the sun grew pale; the panels of the firmaments shone not; neither did the stars give light; Rishis ceased their hymns; and gods and demons alike were muted; thick darkness enveloped the sky like blankets. 12.2. Virabhadra and his Ganas set out in chariots drawn by ten thousand lions. Among his bodyguards were Sixty-four groups of Yoginis, Shakhini, Dakhini, along with Bhutas, Pramathas (churn spirits) guhyaka (guardian of hidden treasures), Bhiravas, kshetrapalas and other types of spirits and fiends. 13.1. In the meantime, Dadhichi, one of the sages assembled at the Yajna is distressed when he learns that Rudra had not been invited. He queries Daksha, “Why do you not offer homage to the god who is the lord of life?” and remarks “The man who worships what ought not to be worshipped or pays not reverence where reverence is due , is guilty, most assuredly , of heinous sin”. 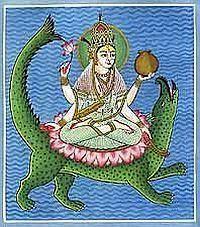 To which, Daksha laughs and replies “I have already many Rudras present, armed with tridents, wearing braided hair, and existing in eleven forms. I recognize no other Mahadeva”. Dadhichi offended by Daksha’s reply walks out of the Yajna warning it would not be completed. 14.1. Then the gloom emerged fearful and numerous hideous forms, shouting aloud frightening battle cries instantly broke and overturned the sacrificial altar and danced amidst the oblations. Running wildly hither and thither like hurricanes they tossed about the implements and vessels of the yajna. The piles of the wood and the beverages stocked for the Devas like little mountains; the rivers of milk; the banks of curds and butter; the sands of honey, buttermilk and sugar; the mounds of condiments and spices of every flavor; the undulating knolls of flesh and other vandals ; the mounds of celestial liquor , pastes and confections which had been prepared; these the spirits of wrath devoured with glee . 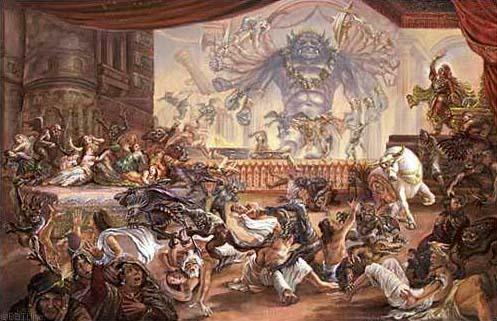 Then falling upon the assembled Devas the vast and furious Rudras mocked and insulted the nymphs and quickly put an end to the Yajna. 14.2. 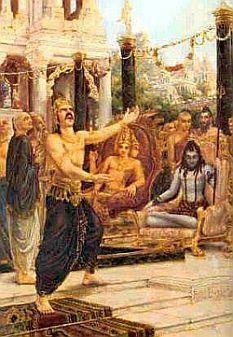 His sacrifice being destroyed, Daksha overcome with terror and utterly broken in spirit fell upon the ground. The multitude of the assembled Devas in disarray cried out helplessly “O Rudras have pity on us thy servants; o lord dismiss thy anger”. They all pleaded “Declare who you are. Which Deva are you”. Virabhadra shouted back “I am not a Deva or an Aditya; nor I come here for enjoyment; nor am I curious to see the various Devas. Know you all that I am here to destroy the despicable Yajna of Daksha; I am Virabhadra springing forth from the wrath of Rudra; Bhadra kali who sprang from the anger of Devi is sent here with her multitudes of spirits to destroy the yajna. Take refuge you all Devas and Rishis at the feet of Rudra the lord of Uma; f or better is the anger of Rudra than the blessing of the Devas (ymram Icrodho ‘pi devasya vara-danam na chanyatah)”. 15.1. The story, though it highlights vandalism and destruction, it is, in essence, the glorification of Shiva as the Supreme Lord. He destroyed the sacrifice from which the Devas had excluded him; and having destroyed it he made it the whole again and won his share. After the destruction of the Yajna the Devas lost their creative power. It is said; the Devas did not fully understand Mahadeva the great god, ferocious and kind at the same time; ruthless at one time, kind and benevolent at another; a demon and an ascetic. That is the pristine nature of Shiva. 15.2. 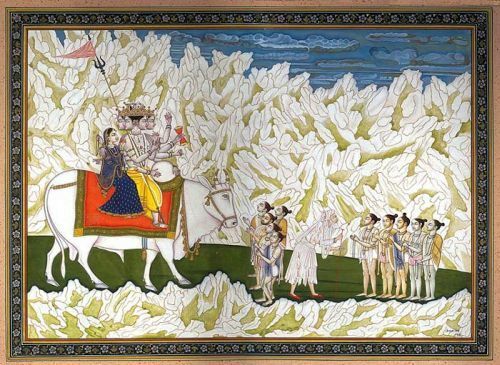 As the Devas praised Shiva they all Pashus were relieved of their bonds and Shiva became their Lord Pashupathi. He gave back to each god his of creative power and understanding (Varaha Purana 21.78-82;33,25-28; and Mbh .10.18.22-23) . The gods recognized Shiva as the lord of the knowledge that liberates – Pashupathi. 15.1. In substance, the event was primarily a solemn Vedic event to which all important persons of that age were invited. 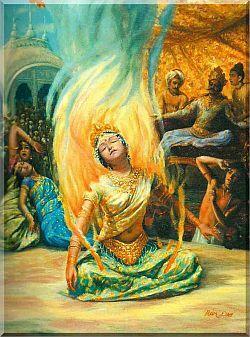 Daksha who performed the yajna appeared a follower of Vishnu; and obviously there were many others who were not. A participant, perhaps a follower of the Pashpatha School which dominated the mountain areas, points out the lapse in not inviting Shiva and suggests that could be rectified by more equitable representation. Daksha annoyed at that, spurns the suggestion. But eventually Daksha learns his lesson the hard way; and submits to the strength of the Pahupathas .It was the triumph of Pashpatha; but then thereafter they seemed to soften their stern stand. 15.3. The sage Bhrigu spokesperson of the orthodox who were present at the sacrifice launched a counter attack and cursed the Pashupathas : ‘Let those who practice the rites of Bhava (Mahadeva) having lost their purity, deluded in understanding, wearing matted hair, and ashes and bones, let them undergo the initiation of Shiva, in which spirituous liquor is the deity ”. 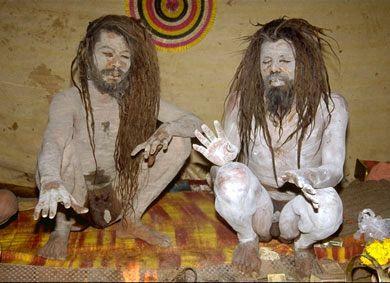 The Pashupathas that Bhrigu described might be the forerunner of the Naga Sadhus of all weird appearances who throng the Kumbha Mela. 6.1. As if to justify Brighu’s curse, the Pashupathas and various schools of Avadhutas emerged strongly after the Daksha –yajna episode. And, despite their heretical stand they gained acceptance within the Vedic traditions as the essence of the most sublime spiritual wisdom. 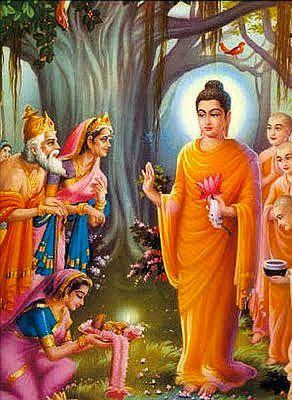 For instance, the classical texts Avadhuta –Gita, Astavakra -Gita and similar other texts celebrate the glory of one who has no use for social etiquette, not bound by any dharma, never knows any mantra in Vedic meter or any ritual; and having renounced all, he moves about naked, roams the earth freely like a child, like an intoxicated or like one possessed; perceives the Absolute, the All, within himself. These extreme schools decried scriptural learning: There are no divine scriptures, no imperative religious practices; there are no gods, no classes or races of men, No stages of life, no superior or inferior; there’s nothing but Brahman, the supreme Reality. 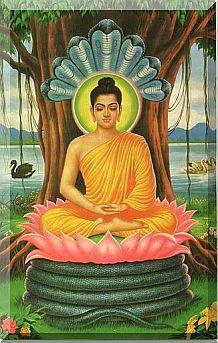 He is the embodiment of detachment and spiritual wisdom. 16.2. Shakthas who along with Pashupathas perhaps had strong presence in the mountain regions emerged stronger after the Daksha-yajna. The Daksha-Yajna lore provided them a base for building their legends and temple -chains of Shakthi Pithas .These legends grew rapidly ; and the Pithas associated with Devi’s organs and ornaments soon grew from four to one hundred and eight. The lists of Shakthi Pithas varied from text to text and from region to region. And, eventually, Shakthas too moved into the inner circle of the tradition through various forms of Tantra and Sri Vidya; and laid claim in the Vedic rituals. Later, the cults of Shiva and Devi drew close to each other ; and their merger was symbolized by Shiva-Shakthi, Ardha-narishwara formed by two halves- one each of Shiva and Devi . On a metaphysical level it was the union of the active and passive principles in the universe. 17.1. A branch of the Pashupatha cult spread to the South India in its moderate form. 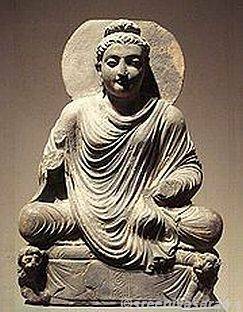 It came to be celebrated as the sublime and mysterious Siddha tradition of South. The Siddha is one who has attained flawless identity with reality. 17.2. 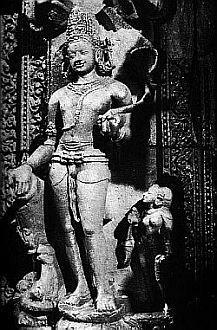 I cannot resist mentioning here the remarkable Karaikkal Ammaiyar (sixth century) the forerunner of the Siddha tradition in the South and who in the prime of her youth abandoned the respectable life of a traditional dutiful wife and chose to embrace extreme asceticism of unswerving devotion to Shiva in his terrible Bhairava form. This amazing woman was born as Punitavathi into an affluent trading family in the coastal town of Karaikkal, Tamil Nadu. She had to give-up her home, hearth and husband because of rupture in her domestic life. Punitavathi rejected the social and domestic world of conventions and obligations. She then took shelter in the cremation ground as one of Shiva’s Gana, an adoring ghoulish attendant. Punitavathi beseeched Shiva to divest her of the burden of her flesh asking only that she watch him dance into eternity. It is said; a miracle occurred: In place of the young woman stood an emaciated hag. She even began to look like an emaciated frightening attendant of Bhirava haunting the cremation ground. Known from henceforth as Mother of Karaikkal (Karaikkal Ammaiyar) she came to regard the cremation ground as the truly beautiful place of liberation and the ideal abode to dwell in peace with the Lord of Universe. From then on she wrote poetry in praise of Shiva. This image portrays her not as a fearsome figure but as a once-beautiful woman who has lost her flesh. Her calm, smiling face expresses her inner peace while she blissfully plays her cymbals and sings to the glory of Shiva. 17.3. Ammaiyar in her poetry asserts that to know Shiva, ones state in life or ones gender is irrelevant; but one should truly transcend the limitations of ordinary human awareness and should give up a life rooted in conventions, attachments and rituals. She does not talk of temples, worship, rituals etc; and she criticizes those who vainly attempt to know Shiva through hallow rituals. Liberation from cycle of rebirth and to attain the nature of Shiva is the aim of Shaiva-siddantha. Ammaiyar exhorts devotees to meditate in intense devotion on Shiva the ultimate truth and the only means to salvation. 17.4. 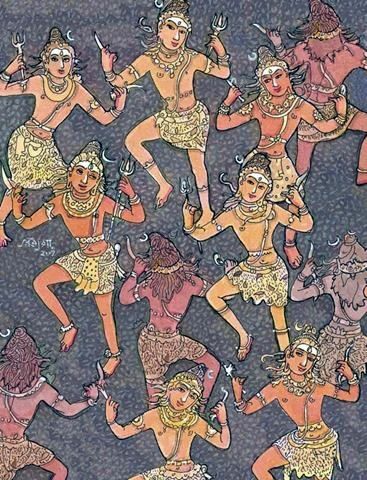 Through her powerful poetry, Karaikkal Ammaiyar proclaims that the horrific cremation ground is indeed the cosmos; and the terrifying form of Shiva performing his dance of destruction is really the most sublime and blissful expression of the Lord. She makes the terrible look beautiful. 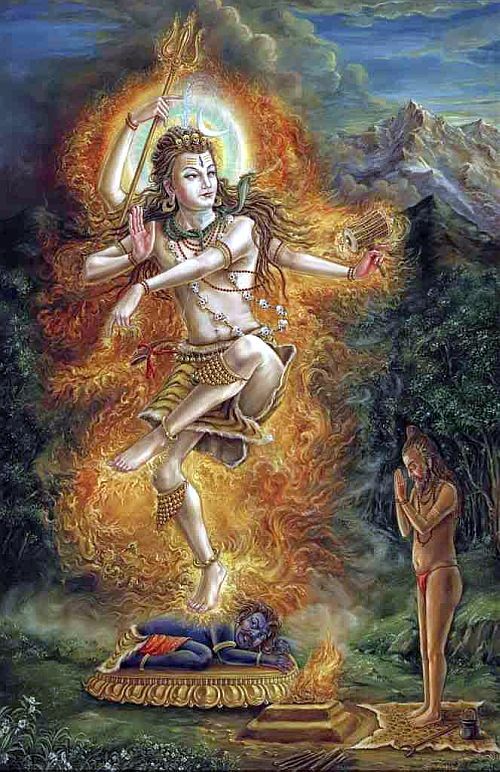 Ammiyar asks one to go beyond terror and revulsion associated with the dreadful cremation ground ; to regard it as the theater of Shiva’s dance of life and death ; and as the sacred grove of liberation from this world. 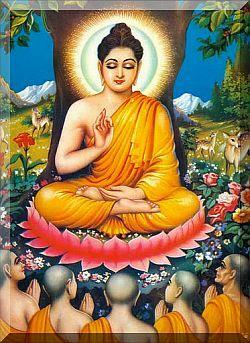 It is where one overcomes fear of death and the fear of losing attachments. She explains cremation ground as the state of one’s mind, as the space in ones heart where the ego and ignorance are burnt to ashes over which Shiva dances in delight the dance of destruction. 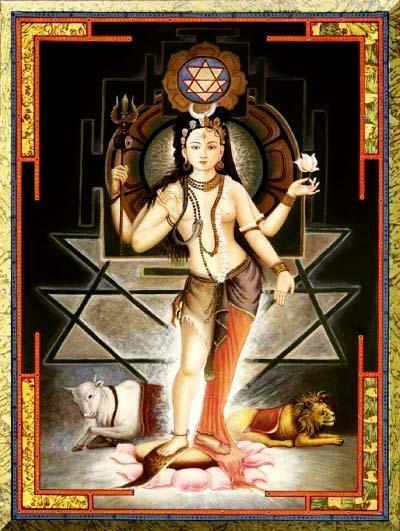 She urges the seeker to revere Shiva as the beautiful embodiment of the rhythm of life, as the destroyer of our illusions, as the conqueror of death, as pure consciousness and the ultimate sovereign of the universe. Come together and feast on the corpses. 17.5. Kariakkal Ammaiyar’s poetry is filled with vivid images of Shiva as the heroic god whose grace rescues his devotees from sorrows of the world. Bones are a central liberation motif in Karaikkal Ammaiyar’s poetry. Shiva adorns himself with a garland of bones he finds in the cremation ground. 17.6. Karaikkal Ammaiyar’s extreme asceticism (Pashupatha) portrays the state where the seekers strived, in body and spirit, to be Shiva the terrible Bhairava residing in the cremation ground. Ammaiyar’s way of life and her teachings represent the early phase of Tamil Shaiva tradition before it transformed into a temple-based orthodoxy. It is said; because of its extreme views, Karaikkal Ammaiyar’s poetry is not normally sung in Shiva temples today along with the devotional hymns of the Tevaram poets. With complexion of setting sun and of a smoldering fire. Snakes and bones of others. His streaming hair flying in all eight directions. Have seen only his ghoul form. Will not be born here in this world in a body with bones. 18.1. As mentioned earlier, the legend as narrated in Vayu Purana is simpler and more restrained. The story however gets complicated and more violent in other Puranas. For instance, in Kurma Purana, Sati is described as the daughter of Daksha prajapathi who is unhappy with Shiva his son-in-law because Daksha thought Shiva did not offer him the respect he deserved. And when Sati his daughter visits him next, Daksha abuses Shiva and turns Sati out of his house. Sati in deep sorrow and anguish gives up her life. Shiva on hearing the horrible news curses Daksha. Shiva then did penance and obtained Sati again reborn as Parvathi daughter of Parvatha-raja. 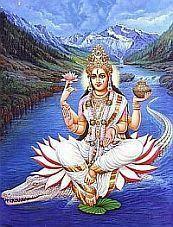 She also undertook penance to obtain Shiva as her husband. It is in her next birth that the much talked about Yajna takes place. The Linga, Matsya, Skanda, Padma and Bhagavatha puranas mention of disputes between the daughter and her father in greater detail and say that Sati put an end to herself out of devotion and love to her husband. 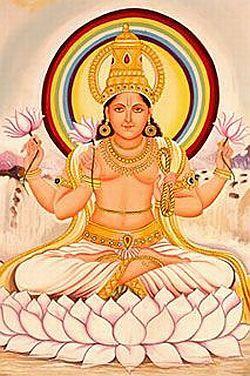 It is only in Kasi kanda, a long poem, forming a part of the Skanda Purana that Sati throws herself into fire. This could be an improvement over Vayu purana and other versions. 18.3. The destruction and violence are particularly described in these texts. Indra is knocked down and trampled upon; Yama has his shaft broken ; Saraswathi and Maitra have their noses cutoff ; Mitra or Bhaga has his eyes pulled out; Pusan has his teeth thrust down his throat ;Chandra is pummeled; Agni’s hands are cut off ;Bhrigu loses his beard ;the Brahmanas are pelted with stone; Prajapathi is beaten up; and all Devas and semi Devas run through the swords, struck with trident or pierced with arrows. 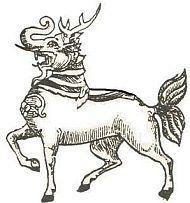 Harivamsa mentions that the Ganas made a hideous clamour and others furiously shouted, when Yajna began to fly up to heavens in the shape of a deer; and Virabhadra cut of its head which then settled in the heavens as the star Mriga-shira. 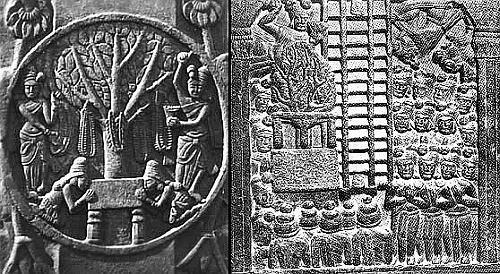 Shiva Purana mentions that Virabhadra pulled out Daksha who was hiding behind the altar, cut off his head and threw it into the sacrificial fire pit, the last sacrificial offering (Sp.2.2.37-61).Another version mentions that Virabhadra gave the severed head to Mahakali who played with it. Later, it is said, at Shiva’s instructions the gods put the head of the sacrificial goat on the decapitated body of Daksha. Shiva glanced at the goat head and Daksha came alive, as if waking from a deep sleep. 18.4. The Vayu Purana does not mention of the conflict between Shiva and Vishnu or the fight of Vishnu with Virabhadra .In the Linga purana , Vishnu’s head is severed and his head is thrown into the sky. The Kurma purana is less irreverent towards Vishnu; it mentions about Vishnu’s conflict with Virabhadra but Brahma intervenes and separates the contestants. The Kasi Kanda of the Skanda Purana describes Vishnu as defeated and at the mercy of Virabhadra .But Virabhadra is directed from heavens not to destroy Vishnu . According to Hari Vamsa , a fight ensued between Vishnu and Shiva during which Vishnu grasped Shiva’s throat and caused black rings marks (suggesting it was not by poision he consumed after the churning of the ocean). 18.5. In every version of the legend a reconciliation takes place between Daksha and Shiva at the end. Daksha free from malice invites Shiva to preside over the Yajna and sings his praise. 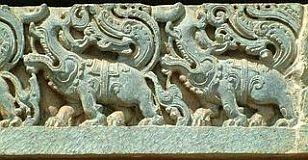 But each Purana bends the Daksha Yajna legend to suit its own pet theme and to further its cause. 19.1. 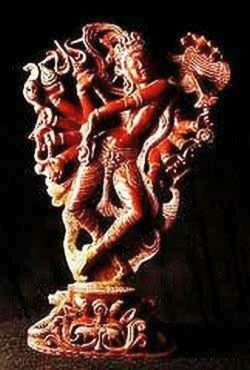 Virabhadra is described as great warrior and one the trusted generals of Shiva. He is also the protector of sages. The puranas attribute to Virabhadra number of exploits against demons and the benevolent acts performed for protection of the holy ones. As an auspicious god, Virabhadra is worshipped greatly in Karnataka, Andhra and Maharashtra regions where numbers of temples are dedicated to Virabhadra. 19.2. 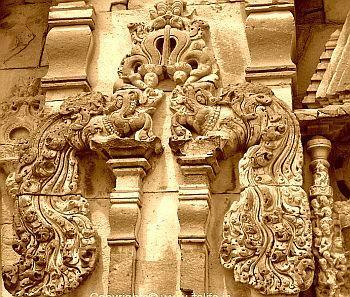 The images of Virabhadra appear in the temples of ninth and tenth centuries sculpted in the deva koshta (niches) figures of gods on the temple walls. In the earlier period they appear as four armed images. And later they expand into eight armed or ten armed images of Virabhadra holding khadga, shula, parashu, dhamaru, bow and arrow etc . 19.3. The cult of Virabhadra – the ferocious and formidable aspect of Shiva- was popular among the warriors of the Vijaynagar period. 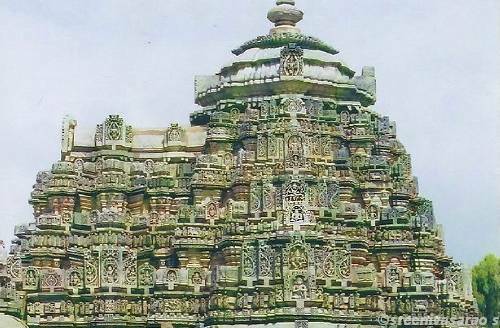 Virabhadra was the mascot, the war- cry and the inspiration of the armies and fighting forces of Vijaynagar.The Virabhadra temples proliferated in the Vijayanagar region mainly in Karnataka, Andhra and southern parts of Maharashtra. 20.1. The awe-inspiring form of Virabhadra is described in various Puranas narrating the tale of Daksha Yajna. His description narrated in Vayu Purana is highly picturesque (as can be seen from the earlier paragraphs).The Shilpa – texts too provide the iconographic features of Virabhadra. But, these relate to worship-worthy images installed in temples. Let’s briefly see a couple of such details. 20.2. The Silpasangraha mentions three varieties of Vlrabhadra (viz. 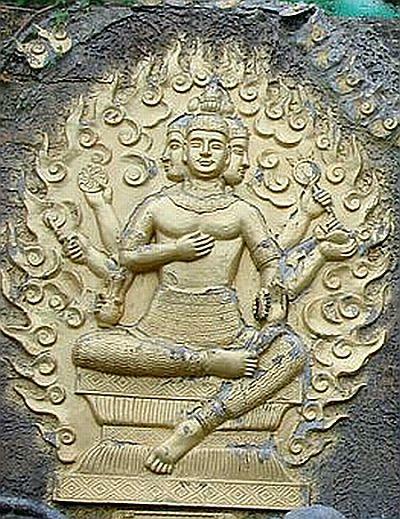 sattva, tamasa and rajasa) with two, four or eight arms. All are dark in color and fierce looking. 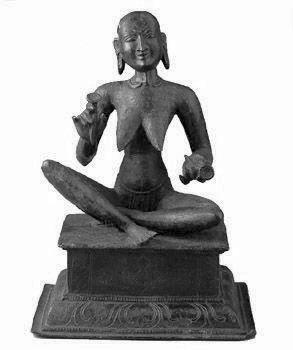 The Seated figures of Vlrabhadra are called Yoga-Vlra, his standing figures, Bhoga- Vlra and those in a walking posture, Vlra-Vira. 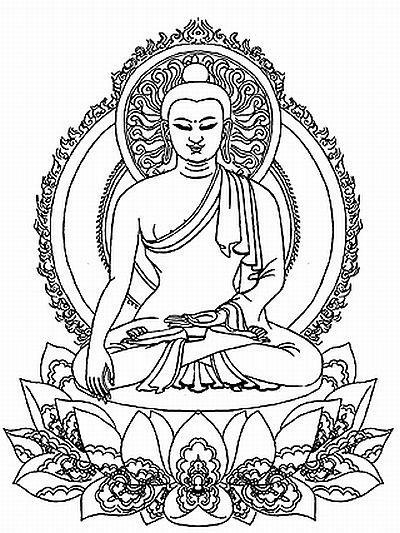 In the first, Vlrabhadra holds a sword and shield and is seated in sukhasana with one leg folded on the pedestal and the other hanging down. In the second posture he exhibits the bow and arrow, sword and khetaka. On the leg is worn the anklet of heroes. The head is adorned with a crown, in the middle of which is represented a linga. A garland of skulls-munda mala – decorates the neck. 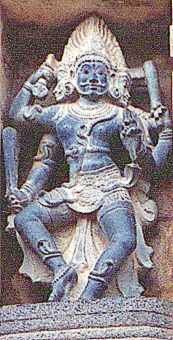 On the right side is the image of Daksha with folded arms. 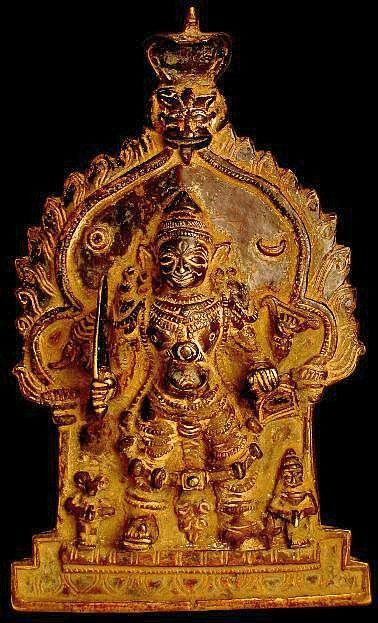 In the Vira- Vlra figures, Vlrabhadra holds the trident (shula), sword (khadga), arrow (bana) and the deer (mriga) on the right side and the skull (kapala), shield (khetaka), bow (dhanus) and the goad (gadha) on the left. 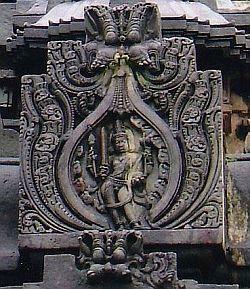 In the form of Shiva as Dakshinamurti ,Bhikshatanamurti or Virabhadra , he is depicted as a wandering mandicant. 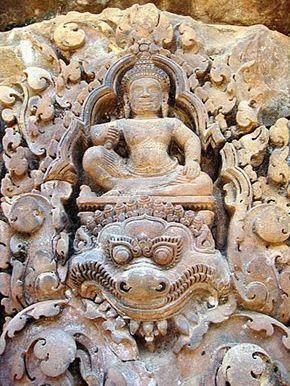 In his Digambara Form, his body is adorned with many snakes ( bhujanga-gana-bhushana ) and his third eye is awesome. His eye brows are knit in anger and his hair is spread out like flames ( Jvala-kesa ). 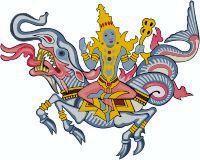 His body is smeared with the and he carries a Gada ( Club ) and Trishula ( Trident ). 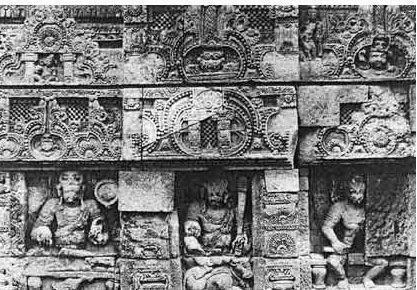 In Sapta-Matrka Panels, Virabhadra is in the right end and Ganapathi is in the left end flanking the Seven Mother Goddesses in between. 20.3. 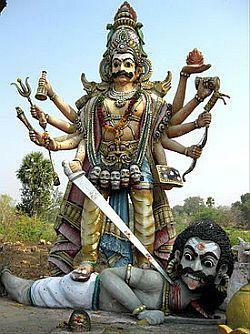 The Pancharatragama describes Vlrabhadra as dark in color, having three eyes and holding in- his four arms a sword, arrow, bow and club.He wears a garland of skulls and has sandals on his feet. A yellow garment is tied round his loins. 20.4. 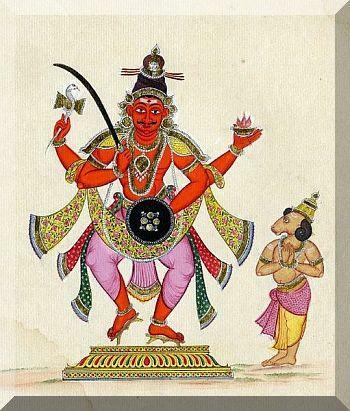 Karanagama describes Virabhadra as one who redeems our Sins, relieves all our sufferings, and mentions that the image of Virabhadra-murti should have four arms, three eyes, head covered with unruly mass of hair (jata-bhara) emitting flashes of lightening and fire, side tusks, wearing garlands of skulls, bells and scorpions. His face should be red blazing like fire, with an angry and fearsome countenance.His neck is blue. A snake should form his yajnopavitha .He should be adorned with beautiful anklets, heavy footwear. He should be dressed in tight shorts – a sort of knickers. 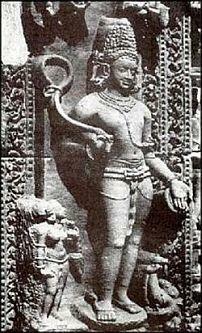 His four hands should carry a broad sword (khadga), shield (khetaka), the bow (dhanus) and arrows (bana). 20.5. 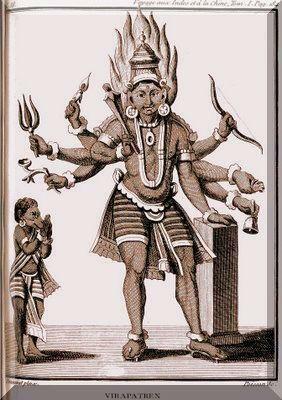 Sritattvanidhi,an amazing iconographic treatise of the 19th century commissioned by the then Maharaja of Mysore Sri Krisharaja Wodeyar III (1794 – 1868) mentions that Virabhadra-murti should have four arms, three eyes, terrifying face with fierce side tusks.He should hold in his right hands a broadsword (khadga) and an arrow (bana); and in his left a bow (dhanus) and a mace (gadha).He should be adorned with garlands of skulls, costumes of a warrior and thick footwear. On to the left of Virabhadra a figure of Bhadra Kali should be depicted. 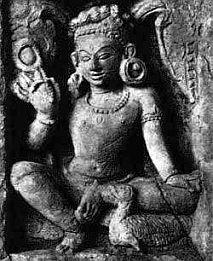 And, on his right a figure of Daksha with a goat-head with horns should be standing with folded hands (anjali –mudra). 20.6. 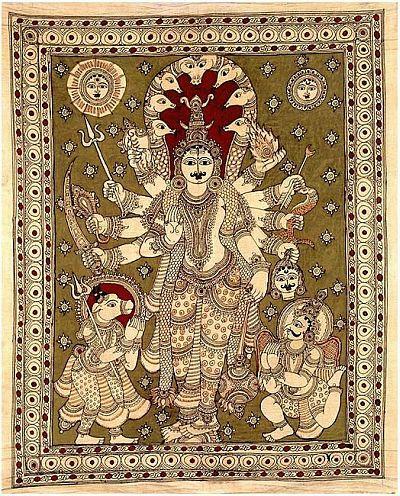 Virabhadra is also depicted with ten arms ; three of the five arms on the right holding an arrow (bana), axe (parashu) and sword (khadga) .In his hands on the left he holds a mace (musala), a bow (dhanus),a lasso (pasha) , a shield (khetaka) and another long sword.The Shilparatna describes him as having eight hands and riding on vetala (a demon) surrounded by his ganas (nija gana sahita).His complexion is white and is fearsome. His disheveled hair is flying like wild fire; and he is clad in tiger skin. 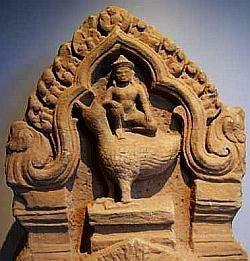 He stamps on Daksha symbolizing suppression of dogma and ignorance. 21. In the Dhyana shlokas of Virabhadra is virtually the Shiva. 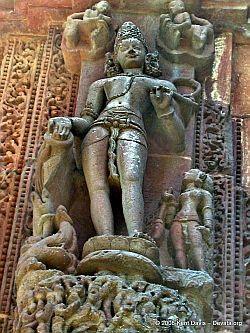 He is described as having white complexion, holding a mriga (deer), veena etc and adorned with snakes. Following are some of such Dhyana slokas. I worship the White complexioned Virabhadra, with half closed eyes along with the third eye in his forehead, his matted hair locked as Jatamakuta. He is adorned with snake- ornaments, tiger skin and garlands of fragrant flowers; holding an antelope. 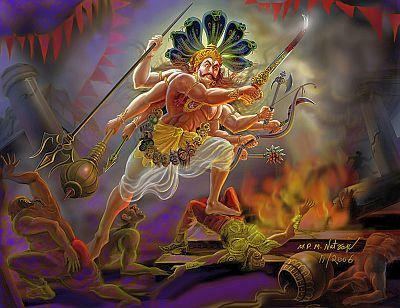 I worship the Black complexioned Virabhadra in a Fierce form with three faces, six eyes, his hair-locks flaming as fire. 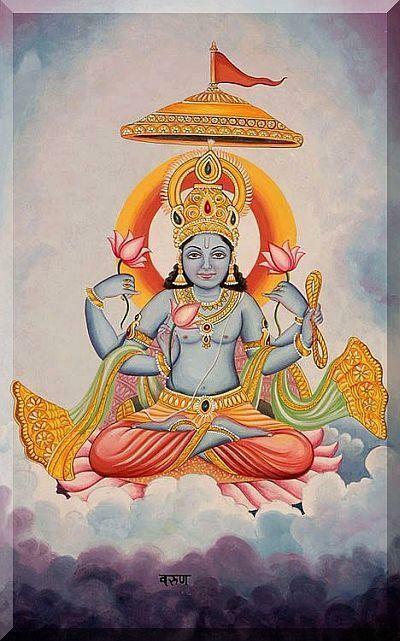 His six arms hold Banapatra (arrow-case), sword, trishula, bow, arrow; and he blesses all who worship him. He tames and controls Bhutas and Pretas (demons and goblins), and destroys the evil and dwells forever in the Hill of Meru. 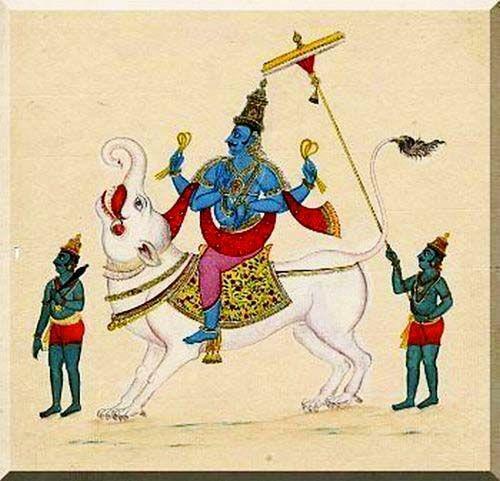 I worship Lord Veerabhadra, of Blue-Black complexion, in a fierce looking form of Shiva with the Sun, Moon and Agni as three eyes representing the Vibhuti of both Shiva and Vishnu, wearing the crescent Moon in his hair , Serpent garlands , ornaments of bells, and holding the sword, shield and club. Dear Atma-Raga, Welcome. Thank you for asking. This again is an interesting question ; and is a tough one to answer. It needs a rather lengthy explanation. But at the end, I fear, it might leave you a bit disappointed. There are various versions of the origin of Rudra, etymology of the term, types of Rudras, their names, attributes and their iconographic representations. It is virtually impossible to detail all the versions in a blog. One has therefore, by sheer necessity, to be very selective. That might not please all or answer all questions. Further, the descriptions of the features of the Rudras in various texts are not uniform. And, in many cases they are incomplete too. 1.1. 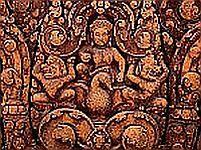 The earliest mentions of Rudra occur in the Rig Veda, where three entire hymns are devoted to him. It is said that there are as many as seventy-five references to Rudra in the Rig-Veda Samhita. Most of those occur in the First and the Second Books. 2.1. Rig Veda mentions a set of thirty-three deities. According to Yaska-charya, the thirty-three gods are divided equally in three different planes of existence namely the celestial plane (dyuloka) the intermediate region (antariksha-loka) and the terrestrial region (bhur-loka) each plane having eleven gods. There is however a slight variation among the different traditions in naming the thirty-three most eminent deities (trayastrimsati koti). According to the Shatapatha Brahmana, these thirty-three deities include eight Vasus, eleven Rudras, twelve Adityas, Dyaus, and Prithvi. While, Yaska-charya mentions: eight Vasus, eleven Rudras, twelve Adityas and two Asvinis. In the Brihadaranyaka Upanishad the Rishi Yajnavalkya at one stage says “The eight Vasus, eleven Rudras, twelve Adityas, Indra and Prajapati are the thirty-three gods”. 2.2. 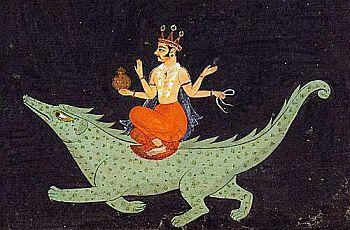 In Rig Veda, Rudra is one of the intermediate level gods (antariksha devata). He is a divinity of the subtle world, the sphere of space, the mid sphere between the spheres of earth and the Sun (Rig Veda 5.3). 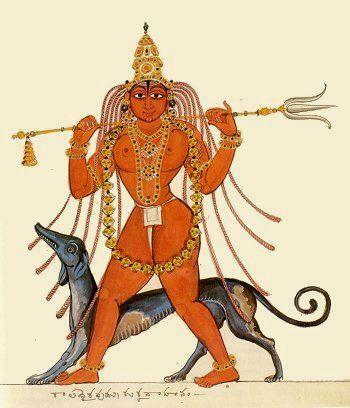 Rudra (the howling one) as a divinity associated with winds represents life-breath (prana-vayu). Rudra is thus the principles of life. Rudra is the intermediary between physical elements and the intellect. 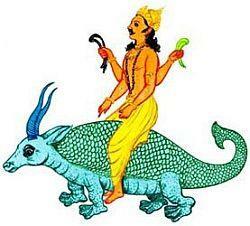 Rudra is thus a deity of the intermediate stage. He presides over the second ritual of sacrifice, the mid-day offering, the second period of man’s life (say from 24 to 50). [ Another interesting feature is that in the hymns of the Rig-Veda specially devoted to Rudra (RV: 1.114 (imā rudrāya tavase); 2.33 (pra jāyemahi rudra prajābhiḥ); and 7.46 (imā rudrāya sthiradhanvane) the proper name of Rudra never appears either in the beginning or at the end of the Pada ; but , it is always hidden in the middle , often suggested by its sound -hints. 3.1.Yajnavalkya, in the Brihadaranyaka Upanishad, queries : Katame rudra iti: “Who are the Rudras?” ; and , then goes on to explain “The ten senses and the mind make eleven. These are the Rudras.””When the senses and the mind leave the body, they make one cry in anguish.” While a person is alive, these eleven: the senses and the mind, subject the individual to their demands, and make him cry in agony if he violates their laws. Chandogya Upanishad also calls Rudra the howler or the red one as Prana , the cause of tears, because : ”verily, the vital breaths are the cause of the tears, for on departing they cause everyone to lament in tears” (Chandogya Upanishad 3.16.9). 4.1. The etymology of the word Rudra is interpreted variously; and at times it is rather confusing. Its etymology has led the scholars into all sorts of wild chase. 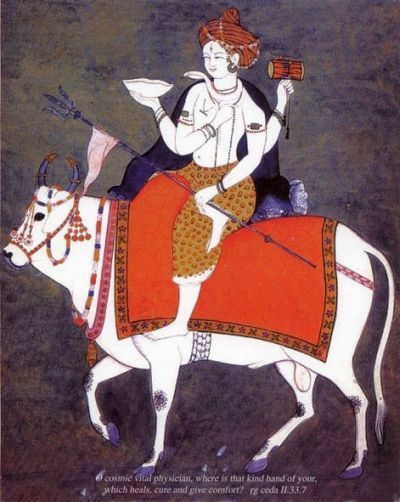 Rudra, in Rig-Veda, is a god of the storm, the wind, and the hunt. His distinctive characteristics are his fierce weapons and his medicinal powers. 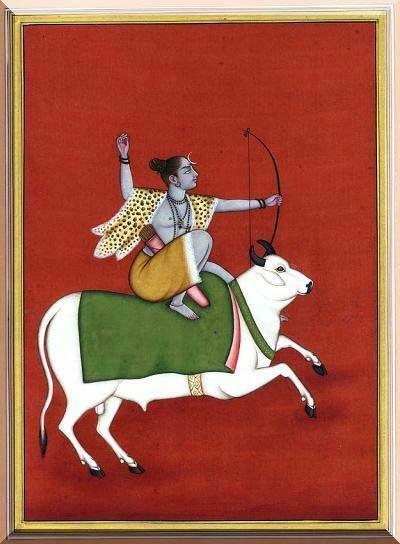 He is the ‘archer’ (sarva – sarv – which means ‘to injure’ or ‘to kill’), the ‘bowman’ (dhanvin) armed with fast-flying arrows (ashu – bana-hastha). The name Rudra has been translated as ‘roarer’, ‘howler’, ‘wild one’, ‘the fierce god’ and ‘terrible’. The alternate etymology suggested as derived from the root rud is: ‘to be Red, Brilliant’, ‘to be ruddy’ or ‘to shine’. 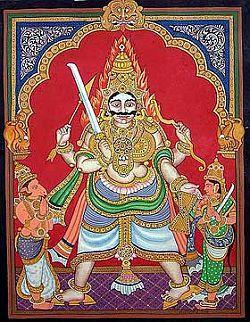 Rudra is sometimes identified with the god of fire-Agni. Rudra is also used both as a name of Shiva, synonymous with Bhava, Sarva, Ugra and Mahadeva. Rudra also means ‘Father of the Maruts’ (ā te pitar marutāṃ – RV 2.33.1); and collectively “the Rudras” is used to mean ‘the sons of Rudra’ or the Maruts. – Rudra is one who dispels (Dravayati) illusions or maladies (Rujum) through his light (Ru). In other contexts, Rudra can simply mean ‘the number eleven’. 5.1. Rudra in the Rig-Veda Samhita is a highly complex divine character with contradictory qualities; and yet harmonizing within himself all contradictions. (I) The magnificent verses composed by the Rishi Grisamada (RV. 2.33) hails the merciful (jalasa) Rudra as the ‘best of all the physicians (bheṣajebhiḥ, bheshaja shiromani ) –Vaidyanatha (RV 2.33.4). He is said to possesses healing remedies – jalasa-beshaja (RV 1.43.4); and, thousand medicines and strengthening balms (jálāṣabheṣajam) – (RV 7.46.3). His gracious hand bestows health and comfort. Prayers are submitted to Rudra : “Do thou with strengthening balms incite our heroes”. He is requested not to afflict children, men and cattle with disease (RV 7.46.2); and , to keep villages free of illness (RV 1.114.1). Rudra is also Shiva the auspicious one who is easily pleased (Ashutosha) with simple adulation. 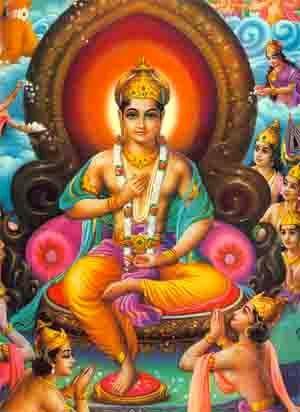 He is also Prachetasa (exceedingly wise); Midustama (the highest of all); and Ishana (the overlord). Rudra is also Svayambhu (self-generated) – RV.7.84.4 – and Trayambaka (three eyed like the Sun or as having three mothers) – RV.7.59.19. Rudra is known for his wealth. He is also associated with Aditya (sun) and Agni. He is addressed as the thousand-eyed one (saharaksha) holding thunderbolts. He is associated with the dramatic fierceness of the thunderstorm and lightening which strike at men and cattle, but which through the rain brings forth peace and plenty. As for the fierce power of the Rudra , all the four hymns mention it; and pray to Rudra not to inflict his wrath upon the humans and the animals ; and , at other times requesting Rudra to ward off evil and to provide protection against wicked forces. . In a hymn (7. 46), Rishi Vasistha admires the wise and compassionate Rudra wielding a firm bow and swift arrows to chasten the unrighteous. Thus, even while Rudra is ferocious, he acts as the upholder of the moral order ; and the protector of the good . (II). 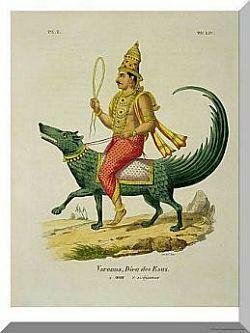 And, Rudra is also “fierce like a formidable wild beast” (RV 2.33.11). He is associated with thunderstorm and lightening; traverses everywhere like lightening – arhann idaṃ dayase viśvam abhvaṃ na vā ojīyo rudra tvad asti . He is fierce Goghana, Purushagna and Kasyad-vira – RV. 1.114.10 – (slayer of animals and men; and lord valiant heroes). He is not purely benefic like other Rig Vedic gods, but he is not malevolent either. Rudra is thus regarded with a kind of cringing fear and respect . 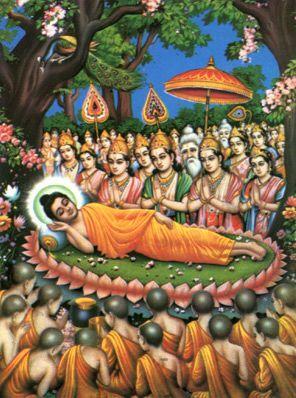 He punishes and at the same time he rescues his devotees from trouble. One appeals to “mighty Rudra, the god with braided hair (kapardin)” for mercy and protection (RV 1.114). 6.1. Rudra is not merely the proper name of a deity; but it also is one that refers to a collection of Rudras ( Rudra-gana) . And, the Rudra-s as a group also signified a powerful host (Gana) of destructive deities often associated with storms (Marut). The Rudra-s represented not only the awesome, destructive fury of the tempest but also the benevolence of fertility, healing and welfare. 6.2. The collective form , the Rudra-s , had two aspects; the fierce , terrible aspects(ugra) ; and the gentle , benevolent aspects (sowmya) – (dve tanu tasya devasya). Thus, Rudra is a fierce deity of stormy winds, deafening thunderbolts, devastating floods and raging epidemics. Rudra is also benevolent; he is wealthy; he reassures the frightened ones and cures deceases. 7.1. The Rig Veda sings the glory and splendor of the Rudra. The Rig-Veda Samhita has four hymns (RV.1.43; 1.114; 2.33; and 7.46) comprising 39 verses dedicated to the Rudra. 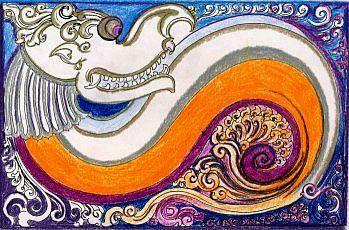 In the hymns of the Rig-Veda, Rudra appears in innumerable forms and colors (puru-rupa). Rudra is depicted as the ever youthful, most powerful, malevolent and terrifying deity , Lord of thunderstorms and lightning, presiding over the entire existence. Rudra who is endowed with strong arms, lustrous body decorated with ornaments and having flowing golden hair is said to be brown or tawny (Bablusha) or blue (Neela) in complexion; shining like sun and glittering like gold is endowed with sturdy limbs (vajra-bahu), charming lips . And, he is adorned with beautiful ornaments such as necklaces (nishika) of dazzling brilliance; and is crowned with mop of braided locks of hair (Kaparin). Rudra is described as fierce; armed with the mighty bow (pinaka), and a quiver holding unending array of arrows and missiles which are terrifyingly swift and penetrating. His fast-flying arrows, ‘brilliant shafts run about the heaven and the earth’ (RV 7.46.3). Worthy, thou carry thy bow and arrows, worthy, thy many hued and honoured necklaces. Maruts are war-minded close knit bunch of exuberant youth. “They have iron teeth, roam like lions, hold bows and arrows and round projectiles; they speed away in golden chariots drawn by tawny stallions. They dwell in the North.”(RV 1.153.6). They are known for moral and heroic deeds. Often brutal, though usually good humoured, they are feared by everyone. 8.2. The number of Maruts varies. They are a group of gods, supposed to number usually either eleven or thirty-three. The Rig Veda speaks of them as twenty-one (RV 1.133.6) as twenty-seven or forty-nine (seven groups of seven each) or one hundred and eighty (triḥ ṣaṣṭis – three times sixty in RV 8.96.8.). 9.01. 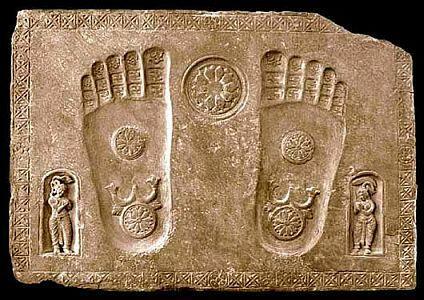 In Rig Veda, as it is often said, the term Shiva occurs eighteen times. 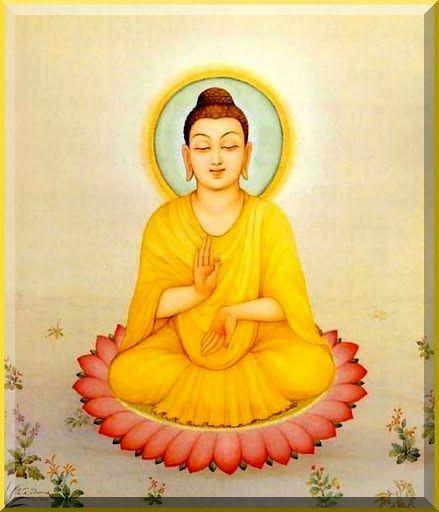 And, each time it is used as an adjective, an epithet standing for “an auspicious one” (mangalakara) in the sense of being “propitious” or “kind” (śivaḥ svavāṃ – 10.92.9). Shiva, in Rig Veda, is not the name of any god. It is a quality found in many gods. 9.02. 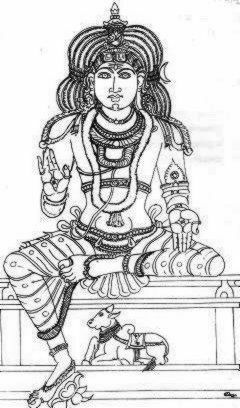 It is said, that Rudra’s identification with Shiva came much later; and for the first time in Svetasvatara Upanishad and later in Yajur Veda (Taittiriya samhita, 4-5-1 – satarudriya section). 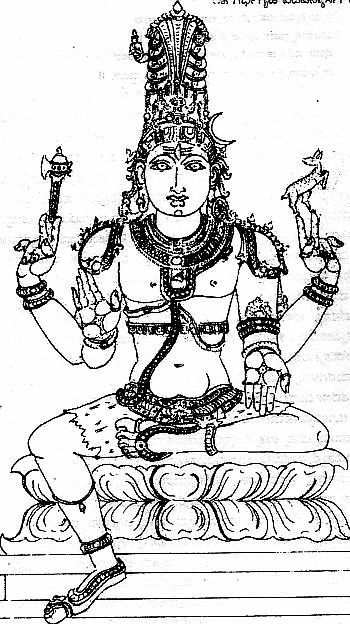 Vajasaneyi samhita (3-63) also identified Shiva with Rudra (tam Shiva namasi). 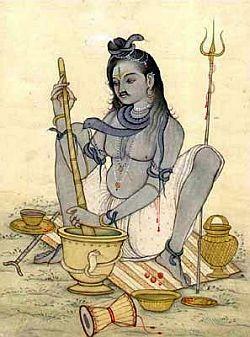 Satapatha Brahmana too said Shiva was known as Bhava, Mahadeva, Sarva, Pashupathi, Ugra and Ishana. Panini (say 4th century BCE) in his Grammar- Ashtadhyayi (1-49; 3-53; 4-100; 5-3-99) mentions that Rudra was called variously: Mrida, Bhava, Sarva, Grisha, Mahadeva and Trayambaka. Patanjali (in Mahabashya) also mentions icons of Shiva along with those of Skanda and Visakha. By Patanjali’s time (say 2nd or 3rd century BCE), I reckon, Shiva as god with his attributes was well established. 9.03. Thus , an interesting reversal had taken place. Rudra, who till then signified a deity, became an epithet or an aspect of Shiva ; while Siva which term till then meant a benevolent or gracious virtue became the name of a great deity. By the time of the Puranas, the aspect of Rudra had merged with Shiva , one of the Grand Trinity ; and , Rudra represented Shiva’s terrific aspect as the destroyer. 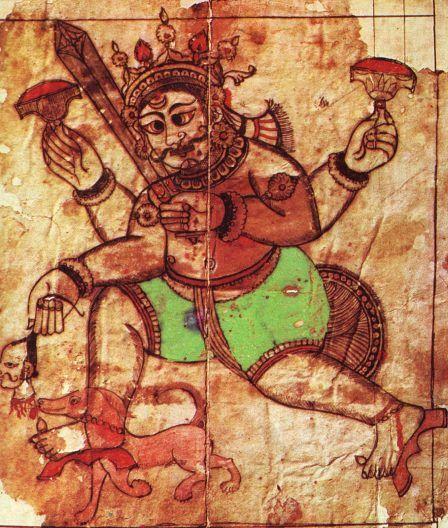 Not surprisingly, Rudra came to be closely associated with the god of death, Yama; with the god of fire, Agni; and with the magical drink, soma. At the same time, he was also an aspect of Shiva the Lord of the universe, the cosmic dancer, the Supreme yogi and master of all yogis. 10.01. The myths and legends that allege the origin of the Rudra abound. There are a variety of stories. I do not propose to discuss them here. Suffice it to say, all those legends have in common the Shiva, anger, howling or crying out loud. 10.02. Rudra who stands for all the intense feelings associated with the entire spectrum of surging emotions, ranging from piteous wail of the one weeping in excruciating pain to the terrifying thunder-clap emanating from clashing universes. It appears; Rudra had his origins in the pre-Vedic distant past lost in the antiquity. It is said; he forcibly entered into the Vedic fold . Since then he has been celebrated and as one the fundamental and Supreme deities of the Vedic lore. In the Agamas of the post Vedic period, we witness the metamorphosis of the Rudra into benevolent Shiva the auspicious; Mahadeva, the Great Lord; and Parameshwara, the Supreme Lord of all Universes. 11.1. Apart from the 39 verses dedicated to Rudra in the Rig-Veda Samhita, the highly celebrated Rudra-adhyaya (the chapter on the Rudra) or the Shata-rudriya (the hundred names of Rudra) , or the famous Namaka hymn of Rudra Prashna also appears in the Vajasaneyi Samhita of Shukla Yajurveda and as also in the Taittiriya Samhita of Krishna Yajurveda. The version of Rudra-adhyaya as in the Vajasaneyi Samhita of Shukla Yajurveda (chapter 16) comprises 66 mantras (here known as kandikas). 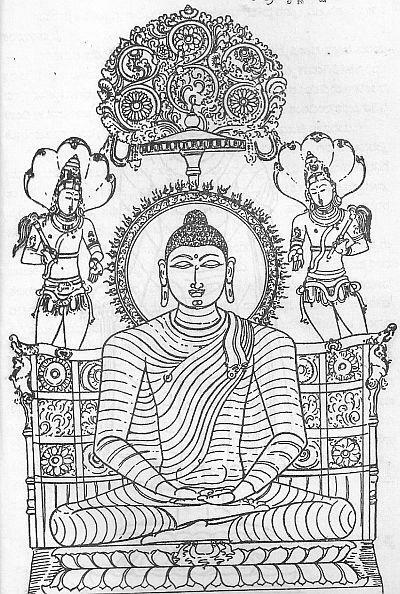 Many of these kandikas are drawn from Rig-Veda Samhita. The other version of Rudra-adhyaya appearing in the Taittiriya Samhita of Krishna Yajurveda (Kanda 4; Praparthaka 5) is more comprehensive having as many as 170 mantras, including the 66 kandikas of the Vajasaneyi Samhita. 11.2.The 170 Taittiriya Rudra mantras are grouped into eleven Anuvakas (sub –sections meant for recitation) in which all the splendorous aspects of and attributes of Rudra as the Vedic divinity have been elaborated magnificently. This highly charged, inspired piece of grand poetry is rendered with great gusto and devotion by the worshippers on all occasions. The style, diction, rhythm, word structure and itintesity of the Rudra-prasna are truly matchless. It truly is a grandest ode to the all-powerful Lord of the Universe, the Rudra. Here, Rudra has been elevated to the height of a sublime Vedic divinity. He is equated with ancient Vedic gods such as Aditya (sun) and Indra (Sahasraksha); and is celebrated as the presiding deity of the forest of evergreen trees (kaksanam pati), as the architect of the universe (stapathi), as also as the commander-in – chief (Senani) of a large army of followers (ganas) possessing countless number of horses (Asvapathi) , the presiding lord (Sabapathi), the minister (mantri), the trader (vanija) and the sharp-shooter (krtsna-vit) and so on. 11.4. Rudra is also addressed through several epithets that are not laudatory; and some of them are even derogatory. He is called lord of robbers (stayunam pathi), the chief of gang of thieves (taskaranam pathi), a cat-burglar (stenanam pathi), a marauding butcher (prakrnta) waiting in the dark shadows holding a deadly chopper, and such many other names. 11.5. Rudra ultimately is the Supreme entity encompassing all forms and colours (Visva-rupa) of the limitless space and harmonizing within him all the contradictions in whole of existence. 11.8. Rudra is thus all pervading and present in every aspect of creation- moving and non-moving; conscient or sub-conscient. Rudra bestows upon us the magnificence of his nature. [The Rudra-Prashna is usually recited along with another passage called ‘Chamakam’ (taken from the Yajurveda -TS 4.5, 4.7) which is composed with words ending with “Cha’ requesting Rudra to grant many, many things in life and beyond. 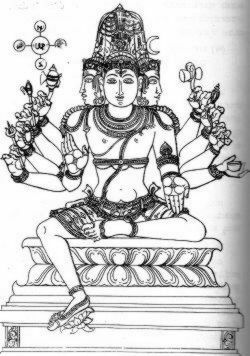 The Chamakam (Just as the Rudra-Prashna) has also eleven sections (Anuvak); and, its each Anuvak corresponds to a force of each of eleven Rudras. “Let these be granted to me. One, three, five, seven, nine, eleven, thirteen, seventeen, nineteen, twenty one, twenty three, twenty five, twenty seven, twenty nine, thirty one and thirty three as also four, eight, twelve, sixteen, twenty, twenty four, twenty eight, thirty two, thirty six, forty, forty four and forty eight – to ensure food and its production, its continuity, and the urge to enjoy, the origin of all productions, the sun, the heaven, the head of all, the infinite, the all-pervading like the sky, time and the like present at the end of total consummation exists at the end of it on the earth as universal form, the Antaryami the immortal, the inner ruler of everything, the Omni present and Omni potent”. The sequence of odd and even numbers carry many interpretations. Some have tried to present these numbers in graphic form. The entire square is divided in to 16 small squares and 64 triangles. If the entire square is folded in the Middle, both sides are symmetric; that is the place where the number 33 crossed the Middle of the square. Each small square is symmetric with crossed lines forming triangles. 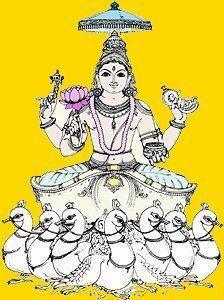 The recitation of eleven sections of Rudra-Prashna followed by eleven section of Chamakam is called Nyasam. This is the normal or the general mode of recitation of these passages. There are other peculiar and complicated patterns of the recitation of Rudra-Prashna and the Chamakam. 12.1. The Rudras are said to be truly infinite (shatam anantam bhavati, asankhyakam). They are present everywhere, manifest in millions of forms in as many abodes; and influence every aspect of creation (sahasrani sahasrasho ye rudra adhi bhumyam…); and they are there even in the food we eat and drink we consume (ye anneshu vividhyanti prateshu pibato janan...). They are immanent within us. They are the protectors of the beings and the created world; the decay and destruction sets in when they refuse to support. Pray therefore to the Rudras for protection and benevolence; and to alleviate our troubles. (Shata rudriyam- Rudra prashna). 12.2. Sri Krishna in Bhagavad-Gita declares, among the eleven Rudras I am Lord Shiva. The Rudras are however talked in terms of sets of eleven- Ekadasa Rudra, inasmuch as the term Rudra has virtually come to represent ‘the number eleven’. 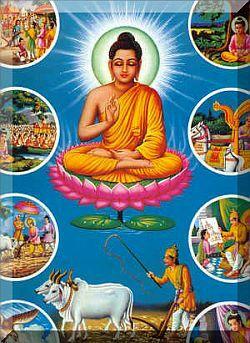 However, each tradition, each text has its own set of eleven Rudras, according to its priorities. Their names and attributes differ from one text to another. There is thus, virtually, a plethora of Rudras. But, each of them represents a certain aspect of Shiva or Rudra. Shatarudriya hymns celebrates Rudra in his eleven forms as : Aghora (benevolent); Kapardi (with matted hair); Girisha (Lord of mountains) ; Bhima( terrible) ; Nilagriva (blue throated); Trayambaka (three eyed); Sabhapathi (master of the assembly); Ganapathi (leader of the hosts); Senani(commander of forces); Samkara(doer of good ); and Shambhu (appearing for the welfare of all). 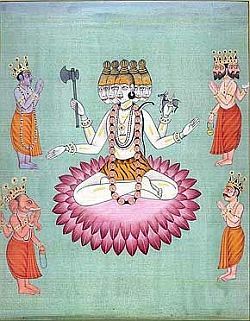 Rudra Prasna (3.5): Bhava; Sharva; Pashupathi; Nilagriva; Shithikanta; Kapardina; Vyupta-kesha; Shasraksha; Shatadhanva; Girisha ; and Shipivista. Rupa-mandana (a text of Shilpa sastra) : Isana; Tatpurusha; Aghora; Vamadeva; Sadyojatha; Mruthyunjaya; Kiranaksha;Srikanta;Abhirbhudhya;Bahurupa; and Tryamkaka. 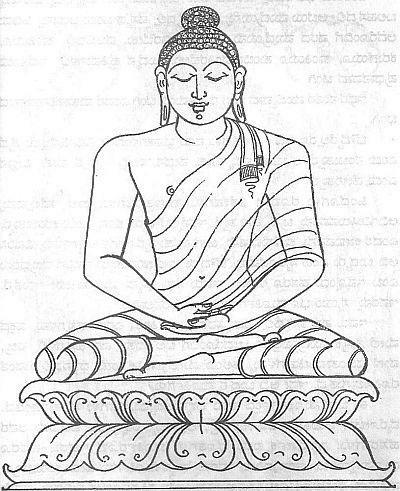 Visvakarma Shilpa (a text of Shilpa sastra): Aja; Ekapat; Abhirbudhya; Virupaksha; Revata; Hara; Bahurupa; Tryambaka; Suresvara; Jayanta; and Aparajita. Amsumad bheda agama ( a text of Shilpa sastra): Mahadeva; Siva; Rudra ;Sankara; Nilalohita; Isana; Vijaya; Bhima; Deva -Deva; Bhava ; and Kapali. Padma Purana: Rta-dhvaja; Manu; Manyu; Ugra-retas; Mahan; Siva; Bhava; Kala; Mahinasa; Vamadeva; and Dhrta-vrata. 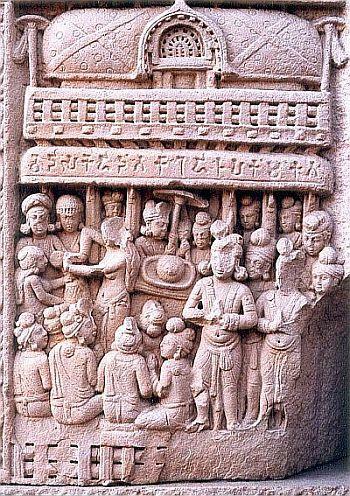 Mahabharata (Adi Parva): Mrigavyadha; Sarpa; Niriti; Ajaikapat ; Abhivardhana ; Pinaki ; Dahana ; Iswara ;Kapali ;Sthanu ;and Bharga. Valmiki Ramayana (4.43): Aja; Ekapada; Abhirbhudya; Hara; Shambu: Tryambaka; Aparajita; Isana; Tribhuvana; Twasta; and Rudra. Srimad Bhagavata (3.12.12):Manyu ; Manu; Mahinasa; Mahan; Siva; Rta-dhvaja; Ugra-reta; Bhava; Kala; Vamadeva; and Dhrta-vrata. Agni Purana (Ch 18) :Aparajita; Hara; Bahurupa; Tryambaka; Vrsakapi; Shambu; Kapardina; Raivata; Mriga vyadha; Sarpa; and Kapali. According to Jothish Sastras (Astrology ) : Kapali; Pingala; Bhima; Virupaksha;Vilohita; Shasta; Ajapada; Abhirbudhnya; Shambu; Chanda ;and Bhava. 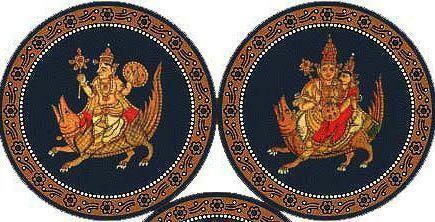 These rule the eleven-division chart called Rudramsha, which indicates the struggles and strife’s of the horoscope. There are prayers to appease the specific Rudras. 12.4. Corresponding to eleven Rudras, there are eleven consorts for them. 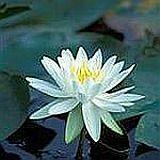 They are said to emanate from the feminine half of the Shiva’s body. 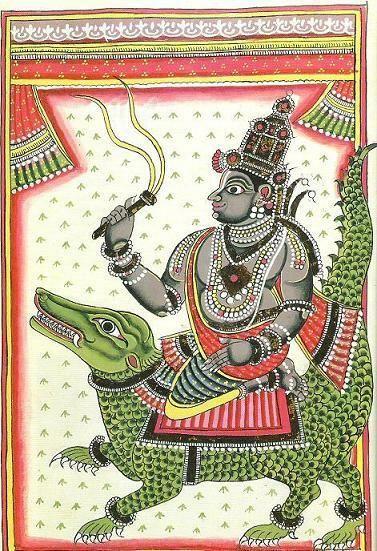 For instance, Dhi; Vritti; Usana; Uma; Niyuta; Sarpi; Ila; Ambika; Iravathi; Sudha; and Diksha are the eleven Rudranis mentioned in Vishnu purana (1.7). 13. 1. 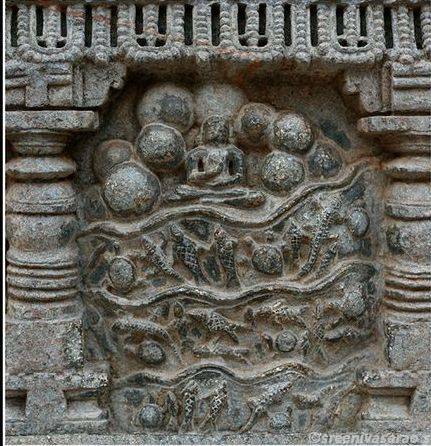 The Iconographic details of the Rudras as provided in the various texts are not uniform. And each text follows its own set of eleven Rudras. The treatment of the subject across the text is rather irregular. For instance, some texts (like Rupa mandana) provide details of the features of the Rudras, their ornaments and the weapons they carry. The Visvakarma Shilpa provides details of only the weapons. In most other texts the information provided is incomplete or is meagre. 13.2. But, as a rule, all Rudras are said to possess forms similar to Shiva. They weave their matted hair in the form of a crown, to which a crescent moon is stuck. Vishnudharmottara, a text dated around 5-6th century, too states that the images of the Rudras should be made as in the form of Mahesvara (Part Three; Ch 72; verses 1-8).It gives elaborate description of how Mahadeva or Mahesvara should be depicted. 13.3. Rudra is described sometimes as tawny (bablusha) ruddy complexion. The term also means a bull (as in Bhabru-vahana). Rudra is therefore often depicted as riding a bull and carrying a trident or shooting arrows. 13.4. Vishnudharmottara states that Mahadeva should be have a moon like complexion and seated on a bull. 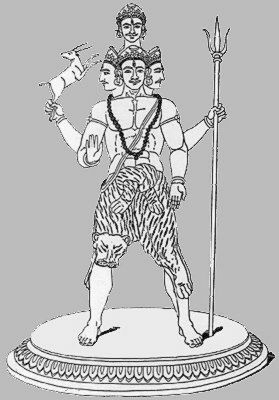 Sadyojata (earth), Vamadeva (water), Aghora (fire) and Tatpurusha (wind) should be shown as his four faces; and Isana (sky) should be his fifth face. His four faces should all be looking placid and the fifth one facing south should be fierce wearing a garland of skulls. All four faces with the exception of the north face (Vamadeva two eyed) should be three –eyed. On the crest of the matted locks of the north face should be the crescent moon, and on top of it should be the fifth face .A serpent should serve as his sacred thread. He should be provided ten arms. 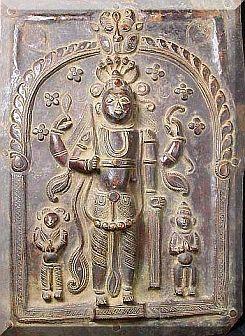 His right hands carrying rosary, a trident, an arrow, a staff and a lotus. In his left hands a citron, a bow, a mirror, a water-pot and skin roll. 13.5. The Shilpa text Karanagama prescribes that Rudra should be represented as white complexioned (kailasabha), five- faced, three-eyed, and four-armed carrying rosary and water pot and gesturing boons and protection. He is clad in tiger skin and is decorated with snake ornaments. He wears matted hair with crescent moon in it. 13.6. Another text Amsumad-bheda-agama states that all Rudras are to be represented as standing in a well balanced posture (samapada-sthanaka) on a lotus pedestal, bedecked with ornaments and flowers; four armed and three eyed; with matted hair done as a crown. They are to be shown as fair complexioned; draped in white garments. They carry in their upper hands battle axes (parashu) in one and black antelope (krshna mriga) in the other. 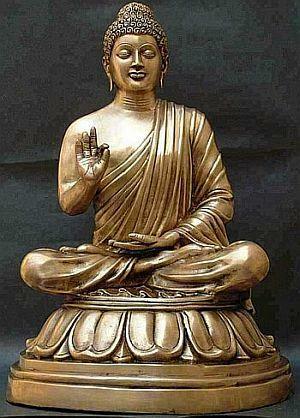 The lower right hand gestures protection (abhaya) and the left bestowing the boon (varada). 13.7. 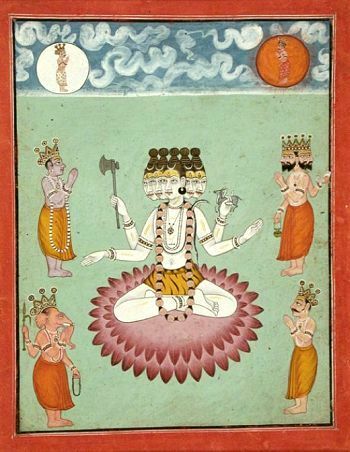 Another Shilpa text –Sanathkumara Samhita (shiva-175-178) provides slightly different iconographic details of Rudra: as having a pearl, moon or jasmine like soothing–bright complexion; four arms; three eyes glowing like embers; and having a coiled mop of hair (jata-makuta) decorated with crescent moon. He is clad in tiger skin and garlands of Arka flowers and snakes. 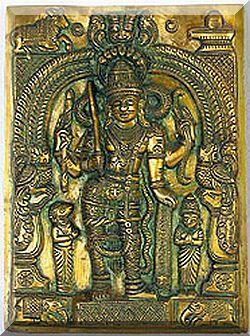 His front two hands bestow blessing (varada) and assurance or protection (abhaya).His upper two hands hold battle axe (parashu) and deer. 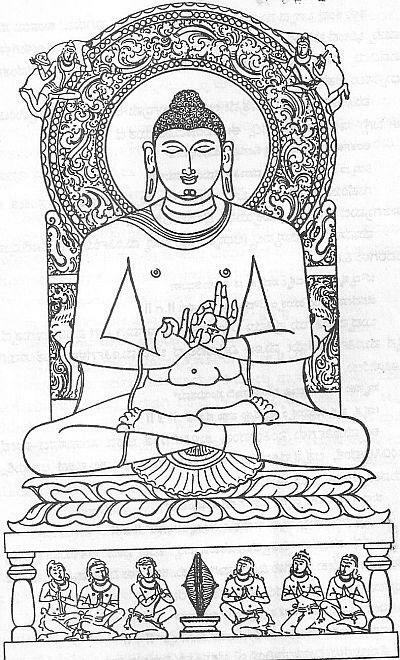 The text prescribes that Rudra could be depicted in seated (aasana) or standing (sthanaka) posture. When Rudra is seated he should be made to face East or West. A standing Rudra could however face any direction. 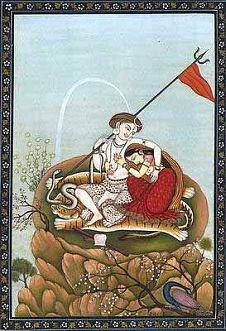 The text also cautions that Rudra should never be depicted in lying down (shayana) posture. Isana (sun): Five faced; ten armed. Crystal white complexion; matted hair done like a crown with a crescent moon in it; ten arms carrying rosary, trident, skull-cup, goad and gesturing assurance (on the right);gesture of protection;. Skull-cup, book, rope and damaru drum.-(karanagama). Sadyojatha: the body, garments, garlands etc are all done in white like jasmine flower, moon or conch. He is joyous and of handsome appearance. He is three eyed and two armed; the hands gesturing protection and boons; and carrying a book and a rosary. His crest is adorned by crescent moon. 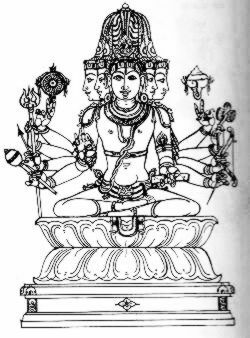 Bahurupi Sadashiva: Five faced each with three eyes; endowed with eighteen arms holding various weapons-axe, bow, arrow, khatvanga etc; skull-cup, book, rosary, water-pot, lotus, and gesturing assurance and benediction. His five faces glow with crystal like luster; Vamadeva face has yellow tinge; Aghora face in blue with sharp fierce tusks; Tatpurusha face is red like lotus with divine grace; Isana face is dark and handsome; and Sadyojatha is clear and bright like a crystal.- (Rupamandana and Kalika purana). 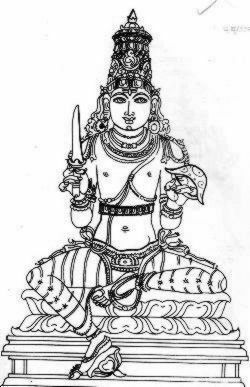 Mrutyunjaya : fair complexion; tiger-skin garment; garland of skulls; six arms; two hands held on the lap in yoga posture; other hands carrying trident and rosary (right) and skull-cup and water-pot (kamandalau) in the left. 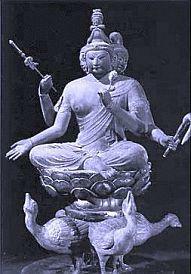 Kiranaksha: fair complexion; dressed in white; four arms –two gesturing protection and boon and the other holding rosary and a book. Srikanta: garments of variegated colour; well decorated with ornaments; handsome face; four arms carrying bow, arrows; sword and shield. Virupaksha: has expanded eyes, a bright face, hairs erect, two hands and a yellow beard. His limbs are reddish –dark in colour; he wears dark garments; holds a majestic staff (death) and is richly ornamented .He rides a camel representing delusion. 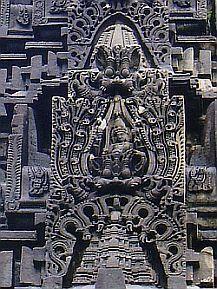 Bhima: is shown having a garland of skulls and carrying a khatvanga (skull –staff). He is jackal faced with terrible fangs and looking angry. He has deep red complexion. 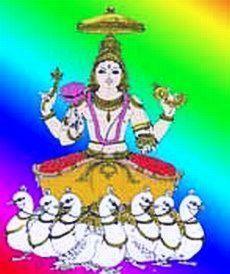 Aja , Ekapada, Revata, Hara, Trayambaka, Suresvara, Jayanta and Aparajita are described with sixteen arms. They hold, in various combinations, the instruments such as: shula, ankusha, kapala, damaru, sarpa, mrudanga, akshamala, chakra, bana, dhanus, ketaka, gadha, khatvanga, pattisa, ghanta, shakthi, parashu, kamandalu, tomarara and pattika etc. 13.9. The other texts like Kalika purana, Padma purana, Vishvakarma samhita, Aparajita puccha, Shilpa rathna, Shiva agama etc too carry their own descriptions of the Rudras. They vary from each other in regard to details such as the number of faces, arms, postures, colour and countenance of the faces. It is virtually not possible to list out and illustrate each of those interpretations. But, all depictions are based in Shiva and his attributes; and are made in the form of Shiva. 13.10. In the popular depictions of the Rudras all Rudras are made to look like the central figure of Shiva. 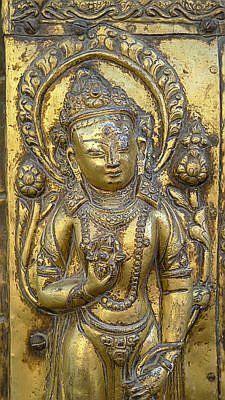 But, one cannot make out which are those Rudras, their names or special attributes, because all are made to look alike. That surely is easier but lacks authenticity. 14.1 There is no standard set of Rudras. Each school, text or authority identifies its own set of eleven Rudras according to their priorities. The details of iconography of Rudras vary greatly across the texts and traditions. There is a considerable flexibility in the choice of the attributes, the physical forms, the postures and the ornaments/weapons. 14.2. It appears, you too may have to select your team of the Rudras Eleven from across the spectrum of Rudras in each category, according to your preferences. Or you may select a particular text and follow its tradition of depiction. For that purpose , you might take the aid of books like Siva Kosa (two volumes) and Indian Iconography (three volumes) authored by Prof SK Ramachandra Rao ; or similar other books , to explore the subject. In case it is possible, you may even consult Shilpa texts such as; Rupasampada, Karanagama, Shilpa ratna, Vishvakarma Samhita or Aparajita puccha etc. These texts do provide interesting iconographic details and, at times, illustrations too. I reckon many of the major libraries in the continent have books on ancient Indian sculpture. 14.3. Else, you may treat this blog as a hint or a place to commence your pursuit; and to improvise your creations based on the few details given here and in the resources I referred to. 14.4. I am not sure I have been of much help to you. If you have read up to here, I admire your patience. Thank you for asking. Writing this article has been a sort of education to me. Kindly let me know if I can be of any assistance. God Bless you.